Cook linguine according to package directions, salting water as desired. Drain linguine, then transfer to bowl. Add clam juice and toss. Set aside. 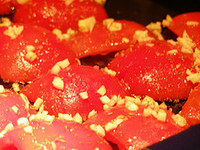 Meanwhile, heat olive oil, minced garlic, and crushed red pepper in skillet over medium heat. Cook until garlic is golden, but not brown. Then add white wine and clams, and bring contents to a boil. Reduce burner to medium-low heat, cover, and let cook 5 to 7 minutes. Remove cover, add parsley, and reduce heat to low. 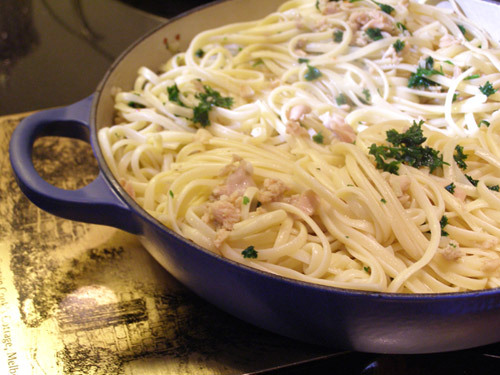 Add linguine and clam juice to skillet, toss well and serve. Note: This recipe is based on a Real Simple recipe, published in May 2002.